"In all ways acknowledge him, and he shall direct thy paths"
The Lutheran church is a direct result of the Protestant Reformation begun in 1517 by Martin Luther in Wittenberg, Germany. 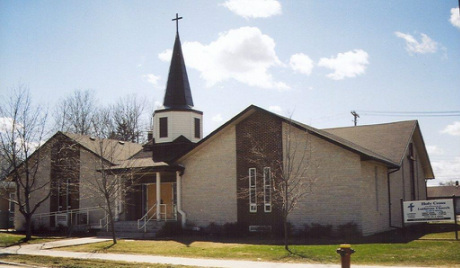 Lutheran Church–Canada was founded in 1988 when the Canadian congregations of St. Louis-based The Lutheran Church-Missouri Synod formed an autonomous Canadian church with three districts. The Alberta-British Columbia District offices are in Edmonton, Alberta, the Central District in Winnipeg, Manitoba and the East District in Kitchener, Ontario. The denomination retains close ties with the LCMS and other Lutheran church bodies around the world which follow the Biblically-based Lutheran Confessions. Holy Cross Lutheran Church congregation was organized and a constitution adopted on March 3, 1904. Rev. K Plunz was installed as the first minister. At this time services were conducted in a house located on the corner of Eaton St. and Herbert Avenue. In 1910 the former Church was built and was followed by the school building in 1913. However, in 1945 due to declining enrollment and deterioration of the school building the congregation resolved to close the school. During the flood of 1950, the basement of the church was inundated with water as high as the windows. Repairs and renovations were made but by 1973 the congregation realized that a new church building was inevitable and the old building was demolished. During rebuilding, services were appreciatively held at St. Gerard's Parish. By the grace of God the new church was dedicated on July 7, 1974. 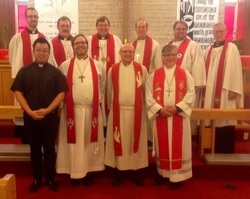 Holy Cross Lutheran Church has thus far been served by 8 pastors. Rev. R. Kruesel answered our call in 1976 and retired in June 2015 after 38 years of serving the congregation. ​Holy Cross was blessed to have Pastor Schoubye answer the call to Holy Cross in 2015! Please click below for more information regarding the Lutheran Church of Canad's beliefs regarding various topics. “Give me one good reason why I should go to church!” That’s a perfectly legitimate and valid question. It may have been in vogue to go to church 50 or 60 years ago; but, as most denominations will attest, church membership and attendance has experienced a steady decline since then. We had better be prepared to provide a good reason for people to start coming back to church. What do churches have to offer that would move people to join them and become involved in worship and service? Let’s take a look at some of the “strategies” that certain churches have employed and the responses we might hear. Church 1: We’re a friendly church. Church 2: Our church has a social conscience and we work for the poor and homeless. Church 3: Our church has all kinds of activities for youth that will help them build character. Church 4: Our church will help you live a happy, meaningful, successful and fulfilled life. Church 5: Our church offers fairs, strawberry socials, oyster suppers, square dancing, Japanese weddings, poverty socials, mock marriages, grab bags, necktie socials, etc. Church 6: We offer you a new life. Well, if you’re like everyone else, you’ve made a lot of mistakes in your life. You’ve hurt people—sometimes even those closest to you; and in one way or another, you’ve disobeyed all of God’s law. Your life is quite broken. It may or may not be comfortable, but it is broken! If you could fix it, why haven’t you? The fact is, you can’t. But God can. He nailed our broken lives to the cross with His Son and in His resurrection, we have a newness of life. Yes. But even better, we’ll provide you with what you need to sustain this new life. You’ll hear God’s promises spoken. You’ll receive the body and blood of Christ in Holy Communion to forgive the deeds of your old life and to strengthen your new life. God will take simple water and connect it with His Word and wash away the old life. We’ll give you something that you can take to the grave and that will one day take you out of the grave! ​What’s the catch? What do I have to do? How much is it going to cost me? There is no catch. There is nothing you have to do. There is nothing you can do. There is a great cost attached to this, but God has already paid it for you. It’s like this: “At one time we too were foolish, disobedient, deceived and enslaved by all kinds of passions and pleasures. We lived in malice and envy, being hated and hating one another. But when the kindness and love of God our Saviour appeared, He saved us, not because of righteous things we had done, but because of His mercy. He saved us through the washing of rebirth and renewal by the Holy Spirit, whom He poured out on us generously through Jesus Christ our Saviour, so that, having been justified by His grace, we might become heirs having the hope of eternal life” (Titus 3:3-7).